As far as Chinese tech companies are concerned, broadly speaking, there are three categories. Firstly, the big hitters like Huawei or Lenovo, that can afford to charge premium prices for their products. Then there are the firms which cannot charge premium prices because they don’t have the relevant quality products, and lastly, the vendors that do not charge a premium, but yet do have products that can compete with the bigger players. Chuwi firmly belongs in that final category and it has gradually built a following with products that strike the right balance between features and pricing. The Hi10, Hi12, LapBook and HiBox have all cemented the manufacturer’s reputation as being a challenger rather than a follower. With the Hi13, Chuwi wants to change gear and aim for the mainstream market. This is a 2-in-1, detachable laptop that features a so-called 3K display, one that can only be found on one other comparable device – Microsoft’s Surface Book. The term comparable is used loosely here as the two products have some significant differences. The cheapest Surface Book costs £1,299 at the time of writing ($1,499 in the US, or AU$2,299) while the Chuwi Hi13 can be purchased for around £270 (about $350, AU$470) from Gearbest, the online retailer that provided us with the review sample. That price is for the tablet only. Add the official keyboard with magnetic docking along with the stylus and the price goes up to around £330 (about $430, AU$575); but that’s still a big, fat 75% less than Microsoft’s signature detachable. Note that those Hi13 prices are exclusive of any taxes that may be levied by HMRC or the courier companies on behalf of the vendor. Want to buy tech from online Chinese retailers? Read this first. The influence of the Surface Book can be seen very clearly in the design here. Chuwi went for an all-metal unibody for the chassis, one that was machined using a CNC process. 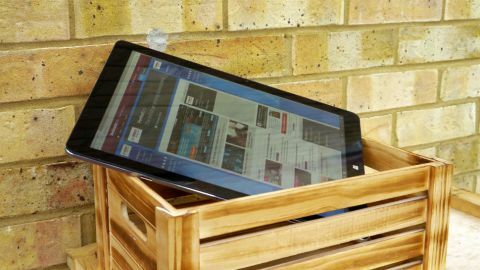 It is dense, solid, and is a far cry from the wobbly, flexing entry-level tablets that Chinese manufacturers often churn out. At 9.2mm on its own and 16.5mm with the keyboard, the Hi13 is surprisingly large given that it is a 13.5-inch device. The thicker bezel means that it has almost the same form-factor as a 15-inch laptop, and at 2kg (1.1kg for the tablet and 900g for the keyboard) it’s almost twice the weight of the Dell XPS 13, the smallest 13.3-inch laptop on the market. Speaking of the keyboard, it can either be removed or used in three other positions (tent, stand and laptop mode), all of which are faithfully reproduced from the playbook of Lenovo’s award-winning Yoga. The Hi13 connects keyboard to tablet via a thick hinge which makes using it on your lap – as a laptop – uncomfortable, indeed verging on painful. At any rate, while the top-line feature matches the Surface Book – an absolutely gorgeous 13.5-inch 3,000 x 2,000 pixel IPS 10-point touchscreen display – the rest of the hardware configuration lags behind. But that’s no surprise given the price; obviously something had to give. The processor used is an Intel Celeron N3450, part of the Apollo Lake family. It is a 6W, 14nm part with four cores, four threads, a base frequency of 1.1GHz, a burst frequency of 2.2GHz and 2MB L2 cache. Such a low TDP means that the Hi13 has a fanless design – the integrated graphics (Intel HD Graphics 500) runs at 200MHz and can overclock to 700MHz. There’s 4GB of LPDDR3 memory, 64GB eMMC ROM (which is significantly slower than an SSD), Intel-sourced 802.11ac Wi-Fi, two cameras, Bluetooth 4.1 and a 5,000mAh battery which can be charged using a 24W (12V, 2A) power adaptor, one that connects to the USB Type-C port. Sadly the latter cannot be used for transmitting data, while the notebook’s microUSB connector can’t be used for charging; that’s only for data. The latter is located on the same side as the earphone jack, a micro-HDMI port, the aforementioned Type-C connector and a microSD card slot. There are no full-size USB ports this time around, although the keyboard dock adds two full-size USB 2.0 ports. A volume rocker and the power button can also be found on another edge of the Hi13. Regarding battery longevity, Chuwi’s tablet fell just short of five hours when playing a YouTube video at full brightness, which is less than we were expecting – but then a 6-megapixel display is likely to consume far more power than lower resolution screens. Speaking of the display, it covers 100% of the sRGB colour gamut with a 480 nits brightness and a 3:2 aspect ratio. There’s very little colour shift, guaranteeing excellent viewing angles. Images look sharp and colour reproduction is spot-on to the naked eye. But the display isn’t without flaws. There is a tiny but noticeable gap between the actual screen and the digitizer glass panel, and it doesn’t use Corning’s Gorilla Glass technology to protect it from scratches. Having such a large surface to work with brings the active stylus pen, called the HiPen H3, to life thanks to 1,024 levels of pressure sensitivity. The stylus has two buttons, performs reasonably well and is powered by a AAAA battery. You won’t be able to hold the tablet for long, though, if you intend to use it at arm’s length, simply due to the weight of the thing. Another pleasant surprise is the fact that Chuwi also managed to integrate four speakers on the Hi13 – one in each corner – which does improve the audio performance of the tablet in general compared to other similar-priced models. Just don’t expect miracles here as the sound is quite muffled and lower than expected. Benchmarks show that the Hi13 is still a very capable machine despite sporting a Celeron processor. For example, it scored a commendable 166 on Cinebench, which is about half what a Kaby Lake Core i5-7200U, as seen in the Asus AsusPro B9440UA for example, can achieve. Well, well; the Hi13 lived up to our high expectations. There are inherent disadvantages associated with a device of this size, like the fact that it is top-heavy, or has a shorter battery life because of the display. And there are corners cut, as well, but they don’t impact too negatively on the overall user experience once you take the price into account. Chuwi judiciously opted for a far more capable Celeron processor (rather than an Atom one), and paired it with just enough RAM and storage, with the centrepiece being the excellent 3,000 x 2,000-pixel display. Compared to the Surface Book or even the Apple iPad Pro (12.9-inch), this hybrid presents a more affordable, dare we say mainstream, alternative if you are in the market for a large format tablet with pen input capabilities. The irony is that potential customers are more likely to balk at the price tag – even if it is a fraction of what the competition charges – because of the risks associated with purchasing an item from abroad.